One way I’ve found that’s helped my toddler be inspired to try new foods is by creating food art! To introduce watermelon and cantaloupe to my daughter, I thought it would be fun to make flowers that look like the ones on Boo’s door (they’re the perfect pastel colors for that!). 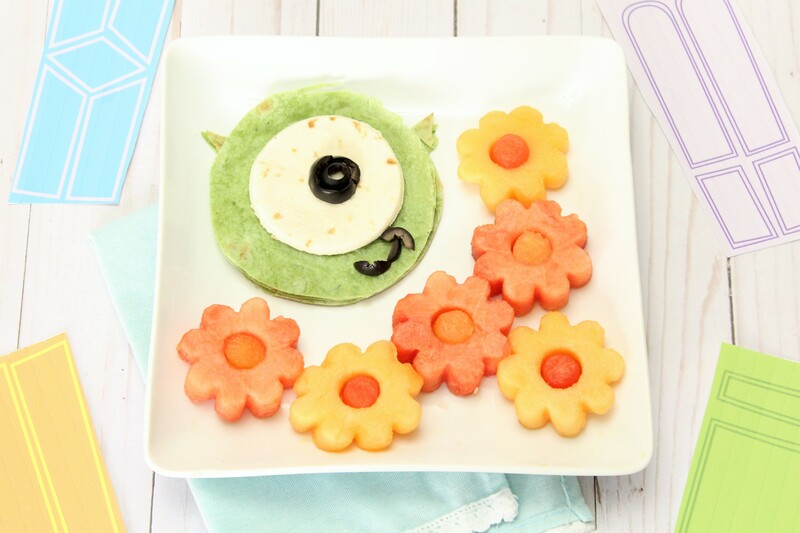 To go along with it, I created a Mike Wazowski inspired sandwich out of tortillas for a healthy lunch inspired by Monsters Inc.! Use a flower cookie cutter to cut flower-shapes from your cantaloupe and watermelon. Cut circles out of each flour, and place your circle cut outs in the middle of the flowers of the opposite fruit. Use a large circle cookie cutter to cut two circles for the front and back of your Mike Wazowski sandwich. Use a knife to cut two small triangles for Mike’s horns. Use a smaller circle cookie cutter to cut out Mike’s eye from a flour tortilla. Assemble your sandwich on your plate along with your flowers. Lastly, cut pieces of black olive to use for Mike’s eye and mouth. I love this healthy lunch food art in particular since it’s one of the simpler food art lunches to make, since you can make nearly all of it just from using cookie cutters (no fancy knife skills required). I would love to hear what other Disney character-inspired food art lunches you would like to see next on TheHealthyMouse.com!